Inscribed, "H. Weekes A.R.A. Sc. 1859"
Private Collection (Canterbury, England), sold to a private collection, about 1965. Source: Letter from Bruce Lindsay of Jonathan Harris Works of Art, June 29, 1995. Jonathan Harris Works of Art (London, England), sold to the J. Paul Getty Museum, 1995. The Exhibition of the Royal Academy of Arts, exh. cat. (London: Royal Academy of Fine Arts, 1859), p. 50, no. 1321, mentioned as "An African Head.". British Institution for promoting the Fine Arts in the United Kingdom, Pall Mall, London. Catalogue of the works of British artists. 1860, p. 24, lot 639, mentioned as "An African Head (marble 80 guineas, plaster 5 guineas)". Graves, Algernon. The Royal Academy of Arts: A Complete Dictionary of Contributors and Their Work from Its Foundation in 1769 to 1904 (1905; repr., London: S.R. Publishers LTD. And Kingsmead Reprints, 1970), vol. 3 (1970), vol. 8 (1906), p. 194, no. 1321. Christie's, London. The Nineteenth Century. 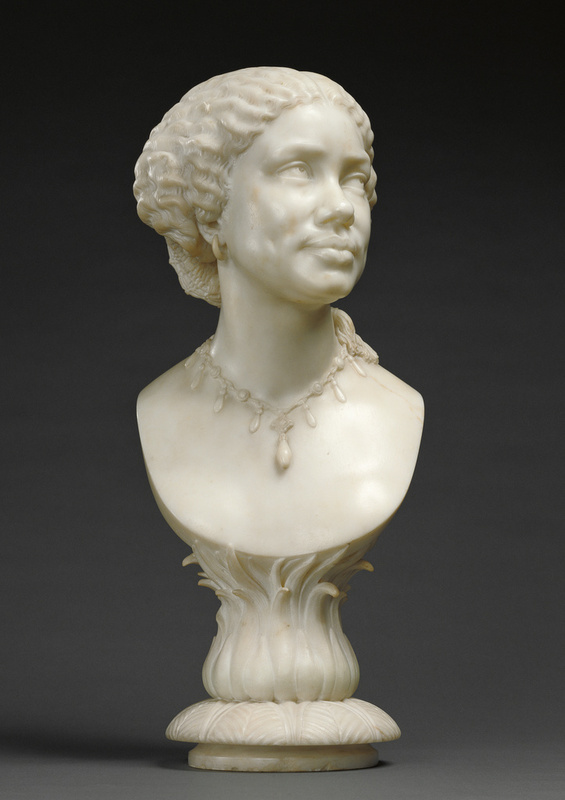 March 2, 1995, p. 107, lot 215, ill., mentioned as "An English White Marble Bust of a Negress.". Jonathan Harris Works of Art (London: Jonathan Harris, 1995), p. 9, ill., mentioned as "A Marble Bust of a Woman, Possibly Mary Seacole.". Fusco, Peter, Peggy Anne Fogelman, and Marietta Cambareri. Masterpieces of the J. Paul Getty Museum: European Sculpture (Los Angeles: J. Paul Getty Museum, 1998), pp. 116-17, no. 42, ill., entry by Peggy Anne Fogelman. Bilbey, Diane and Marjorie Trusted. British Sculpture 1470 to 2000. A Concise Catalogue of the Collection at the Victoria and Albert Museum (London: V&A Publications, 2002), p. 426, under bibliography. In this lesson plan students consider symbolic forms and sketch their own designs for a symbolic sculpture. In this lesson students evaluate their own sketches, choose a final design, and create their own symbolic sculpture. In this lesson Students participate in a class critique of the symbolic sculptures they created.